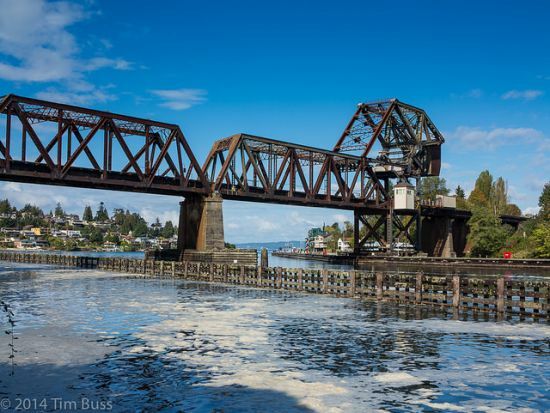 Linking the freshwater Lake Union and the salt-water Lake Washington across a height difference of 22 feet, the Hiram M Chittenden locks allow boats to cross the Lake Washington Ship Canal, relying solely on the force of gravity. Linking the freshwater Lake Union and the salt-water Lake Washington across a height difference of 22 feet, the Hiram M Chittenden locks allow boats to cross the Lake Washington Ship Canal, relying solely on the force of gravity. A salmon ladder with a viewing gallery allows visitors to witness the salmon migration, which with different species allow for viewing throughout most of the year. Adjacent is the Carl S English, Jr Botanical Garden.